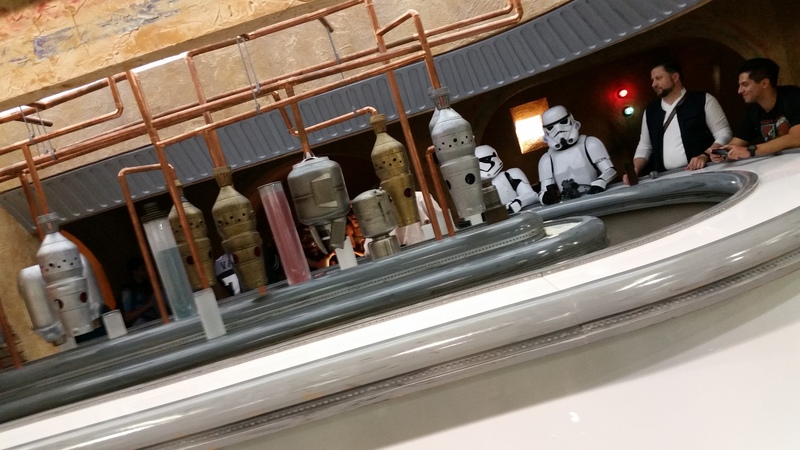 Star Wars Celebration Anaheim in Review! The galaxy far, far away came to Anaheim, CA, over the weekend of April 16-19th to bring a taste of the traveling Star Wars Celebration to the parched desert planet- I mean, state. Star Wars Celebration Anaheim will be a weekend long remembered, as far as fans are concerned. Fans could look at a replica Cantina set, though it was mostly used for private photo shoots. Taking over the Anaheim Convention center for the weekend was no small task, but the giant center for all things Star Wars pulled it off effortlessly. The convention center is the same one that played host to Wondercon 2015, with many hotels right next to the property, gorgeous outer grounds, an array of food trucks outside for hungry con-goers, spacious inner convention space, and a beautiful fountain right out in front. The venue played host to thousands of fans, vendors, actors, and cosplayers, all of whom had come to, well, celebrate the beloved space opera series that has transcended generations. This was my first Celebration ever. And though I’ve braved the likes of San Diego Comic Con (similar to this, in some ways) many times, I’ll admit I was a little overwhelmed in the best way possible. This was non-stop Star Wars every waking moment. Which is exactly what I came for. But you don’t really realize until you’re in it just how immersive and all-consuming the Star Wars experience is. I couldn’t go more than 10 feet without hearing the opening fanfare, the Yavin victory theme, or the Imperial Death March blaring out of some unknown source. I usually hummed along. There was more to see and do here than I could hope to accomplish in a weekend, but I did my best to capture the experience. Like the Force, there was a light side and a dark side of the convention that held the universe- er, weekend- together. This convention had everything Star Wars- and I mean everything. There were vendors with obscure collectibles, toys and plushes you had growing up, artists selling prints of their beautiful work, cosplayers bringing Twi’Leks and Ewoks and Jedi to life. There were tiny children dressed as Leia and Vader and Boba Fett, and there were sights and sounds to bring you from Endor to Tatooine to Hoth and then back to Anaheim. The atmosphere was aided by a legion of life-sized prop replicas, expertly rendered by a Belgian prop builders forum. 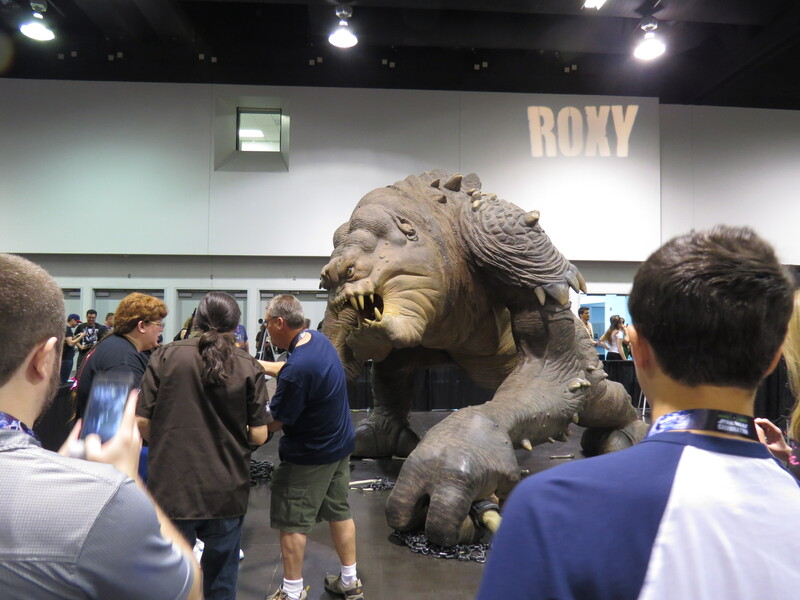 There were roving astromech droids (including, of course, Artoo), replica speeders, a Cantina set, a Bacta Tank display, and biggest of all, a life-sized Rancor named Roxy. You could get your picture taken with her and she wouldn’t even try to bite you! I suspect her handlers kept her well-fed. There were dozens of other sets and replicas I didn’t even look at very closely, like AT-ST walkers and a holochess table. There was even a Jawa droid factory and a moisture farm. Enough to delight any Star Wars fan, honestly. The filmic representation at the convention was obviously skewed towards the original trilogy, but there was a healthy dose of prequel love to be seen as well. Of course, the talk of the newest film kept the convention abuzz with excitement and speculation. There was a costume exhibit in the upper levels for those who wanted a closer look at the “The Force Awakens” material. 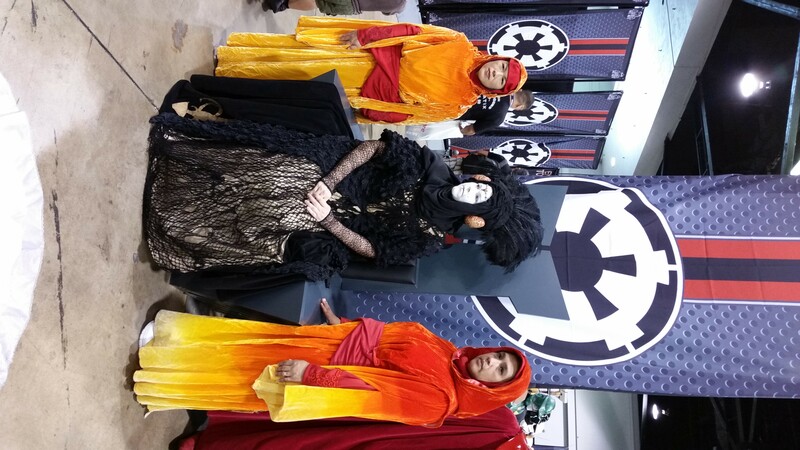 Cosplayers used it as a resource, and in the days after the trailer release, accurate Reys and Kylos were already appearing on the convention floor. The convention center itself was air-conditioned, which was awesome because these events can get really hot, with all the excited people running around and being generally warm. There were several open bars inside serving alcohol to the 21+ crowd that wanted to relax and take a break after the overwhelming fun. One of my personal favorite booths was hidden in the back of the center, featuring the costuming work of the Rebel Legion and 501st costuming troops, famous for being the good guys and the bad guys of the Star Wars universe, respectively. Costumer work was on display along with information on how to join. The artistry was incredible on the costumes, and now I’m inspired to sew up some new Jedi duds. The Queen and her Handmaidens. Also present was Sideshow Collectibles, displaying their impressive array of Star Wars merchandise for the collector types who prefer 1/6th scale replicas as opposed to the plethora of plastic Hasbro toys that some booths featured. They hosted giveaways for Clone Troopers, Artoos, and Vaders- one contest even included a “Star Wars impressions” contest judged by the Dark Lord of the Sith himself. The winner who took home a Vader statue ended up reenacting the famous “I am your father” scene with as much passion as I’ve ever seen anyone do it. All weekend long, you could tell that everyone was there to share their love of Star Wars with others, and pick up some sweet loot along the way. There was a huge autograph area where fans could get pictures and signatures from their favorite supporting cast members, crew members, and even leads like Carrie Fisher (who supposedly glitter-bombed some people), and Mark Hamill. I got to spend some time talking to the talented Kirk Thatcher (Return of the Jedi, Jim Henson’s Creature Shop), who told me about his experience in the creature lab painting up Mon Calamari heads for Episode 6 (then called Revenge of the Jedi). Actresses who played characters like Shaak Ti, Aayla Secura, and Beru Whitesun Lars were all there, as well as the voices of many digitized characters, costume operators who played Ewoks, and dozens of others who helped to bring these incredible worlds and creatures to life. The weekend also featured lots of focus on one of the newest additions to the Star Wars Universe, the Rebels TV series. Season 2 had a red-carpet debut with actors and actresses coming to screen the first episode with fans. Ashley Eckstein of Her Universe, known also for voicing fan-favorite Ahsoka Tano, hosted an “Ahsoka Lives” gathering which drew costumed fans and fans wearing shirts bearing the slogan all coming to celebrate their love of the powerful Togruta padawan. There was so much more going on that I couldn’t possibly list, because it simply had to be experienced firsthand. If you wanted it, it was probably there. I can’t think of any Star Wars fan who could possibly go home unsatisfied with all the weekend had to offer, though there were some minor complications every now and then. You know how I likened this experience to the overwhelmingness of SDCC earlier? Well, it had other similarities too. The main one being lines. Everyone and their mothers and their children were at this convention (no, really, I saw more families than I could count), and whether it was for exclusives or for an event, there were lines. Of course, this is to be expected, but when you’re waiting over an hour or two just to hope to have a chance at grabbing a Celebration exclusive shirt in the cleaned-out store, well, things get exhausting. Many woke up early to brave the line first thing in the morning for the freshly restocked store, but that line could and would cap very quickly, leading to an hour in line, ten minutes in the store rushing with your purchases, and the waiting another hour or so in the even longer check-out line. There were lines for panels too, that often hit capacity even 20 minutes before the door opened. And that’s not even discussing the incredible patience of those who got in line on the Thursday to witness the Episode VII: The Force Awakens panel. No, I’m talking the smaller panels like the Marvel and Star Wars Rebels panels. 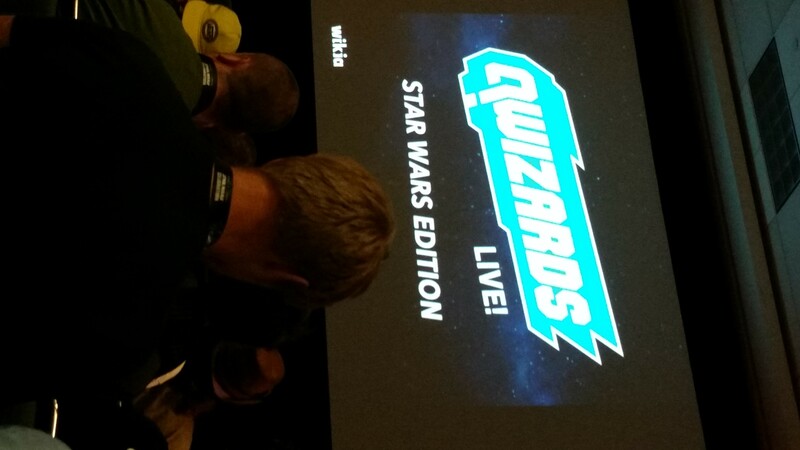 I managed to get into a small trivia panel hosted by Wookiepedia, and even that room on the third floor of the convention center was nearly full up before the panel began. I was surprised to find out I knew more than I thought I did about obscure Star Wars trivia! But again, there are always lines everywhere. The sheer volume of people at this convention far outweighs conventions like Wondercon and Anime Expo. Sure, it was crowded, but everyone was there to share and celebrate their love of Star Wars. So, it was a minor gripe, but easily overlooked because what people were waiting in line for was definitely worth it. Maybe there could be better organization of the lines in the future. Now I’m just being nitpicky. Star Wars Celebration Anaheim was everything I hoped it would be and more. The people and the atmosphere really emphasized the celebration aspect, and it felt like one giant Star Wars party all weekend long. What could be better? It was an extremely unforgettable experience and was truly a love letter to the fans and creators who have kept this phenomenon going so strong over the decades. It truly is a pilgrimage every Star Wars fan must make at some point in their lives. The convention travels yearly, though, so it’s best to keep an eye on where it will be popping up next. Disclaimer: I was provided by the showrunners of the convention with a complimentary Media pass to attend the event.